Memorial Day Mystery ... Solved! Memorial Day Greetings to the extended Mullen Family! I hope that everyone had an enjoyable day while remembering those who sacrificed their lives in the defense of freedom throughout the world. Marilynn and I spent the day relaxing in Cranbury. For some reason, it's always fun to simply set up a couple of lawn chairs and watch the Cranbury Memorial Day parade pass by our house. 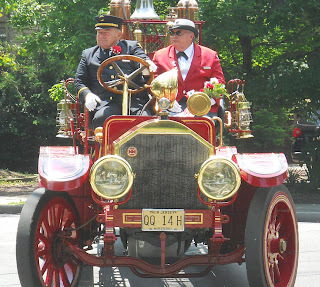 In many ways, it's an old-timey-time parade -- no lavish floats, a couple of marching bands, Boy Scouts, Girl Scouts, Brownies, Twirlers, local politicians, antique cars, lots of fire engines and, if we're lucky, a 5 or 6 gun salute by the Civil War reenactment group. Once again this year, Marilynn marched in the parade as part of the Cranbury Library. 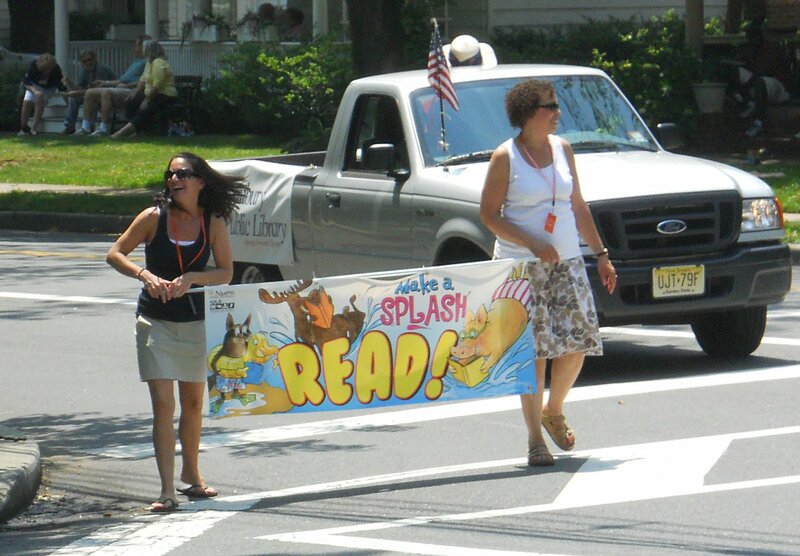 I thought I had caught Marilynn in the photo below, but she was lagging far behind the front banner, handing out bookmarks, shaking hands, and tirelessly campaigning for Library funding by the state. I applauded everyone that went by. 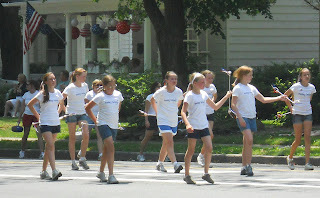 Anyone who was dedicated enough to march in 90 degree heat deserved at least that much! Last year, my son, Dave, was in Cranbury for Memorial Day Weekend. After watching the parade together, we partook (?) in another Memorial Day tradition -- watching the NCAA Division I Lacrosse Championship game on ESPN. Last year's game was a nail-biter, with Syracuse beating Cornell on an incredible last-second goal. I remember the entire Syracuse team erupting into a frenzy and piling on top of one another on the field. And I remember looking at Dave (a former lacrosse player at Princeton High School). I knew what he was thinking: "Man, that looks like fun. I wish I had that experience." Fast forward to this weekend. I repeatedly tried to contact Dave to see if he wanted to watch the parade and lacrosse game with me again. At first, I got nothing. Dave was totally incommunicado. Then, finally, I got the briefest of text messages with a lame and somewhat suspect excuse. What was really going on here? I attempted to contact my other two kids, Andy and Sara, who were up in Lake Winnipesaukee enjoying the weekend. While I was unable to actually talk with them, Sara posted the photo below on Facebook. It shows Andy, his girlfriend, Rebecca, a bonfire, and No-Dave. 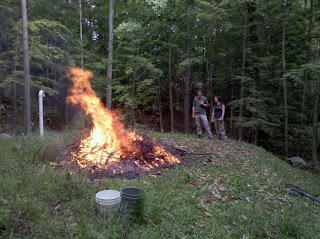 Clearly, if Dave was at the lake he would have been all over that bonfire . So where the hell was he? I soon found out. Daveless but undaunted, I sat down and watched the entire 2010 NCAA Division I Lacrosse Championship game on ESPN by myself, sans beer. At the end of regulation, the game between Notre Dame and Duke was tied at 5-5. I settled down to watch the overtime, but it ended in a flash. 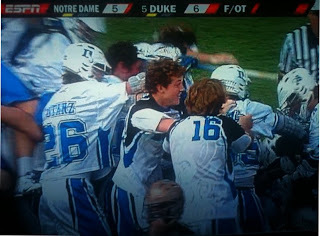 Some long pole from Duke won the face-off, streaked downfield and scored the winning goal in about 6 seconds. The entire Duke team rushed onto the field. Pandemonium ensued. And then, I saw him. Unbelievably, it was Dave!!!! Right in the middle of the pandemonium!! How he managed to convince the Duke coaching staff to let him dress up in a Duke lacrosse uniform and stand on the sidelines, we'll never know. Great job, Dave! Congratulations! I hope it was everything you thought it would be.